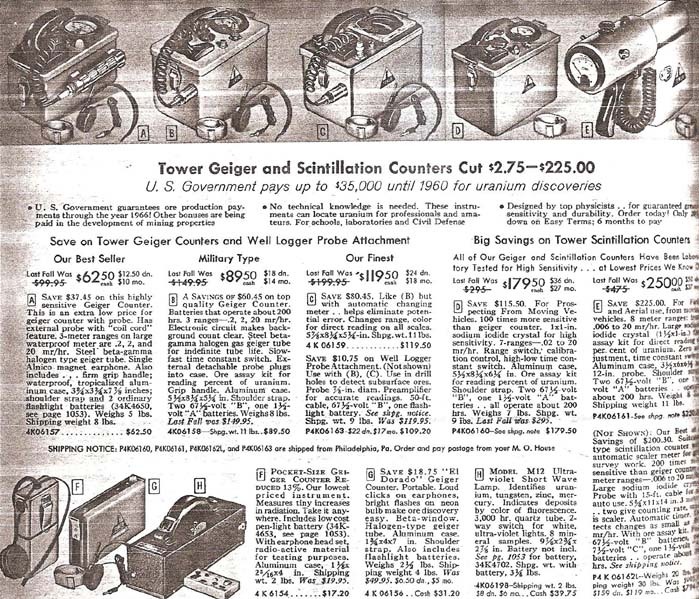 The Sears Roebuck & Company began offering Geiger counters in their Fall and Winter catalog in 1950. 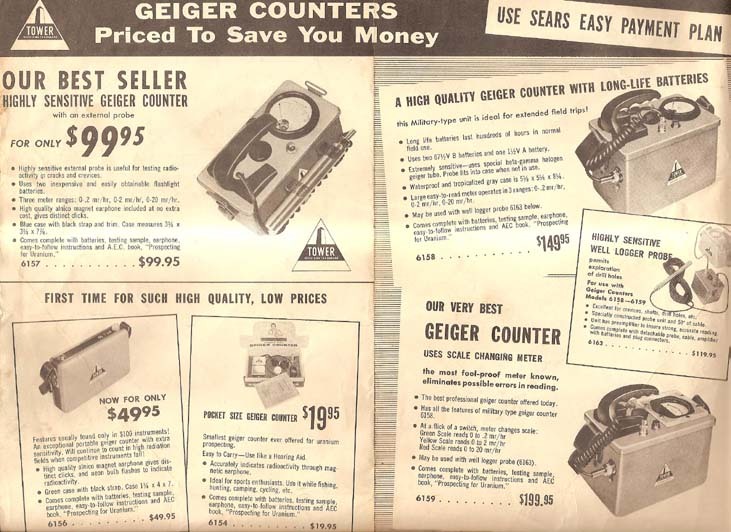 During the Bakersfield, California uranium rush, the local Sears dealer began offering a variety of Geiger counters in their stores. The first Geiger counter offered was the Super Sniffer by Nuclear Instruments and Chemical Company. 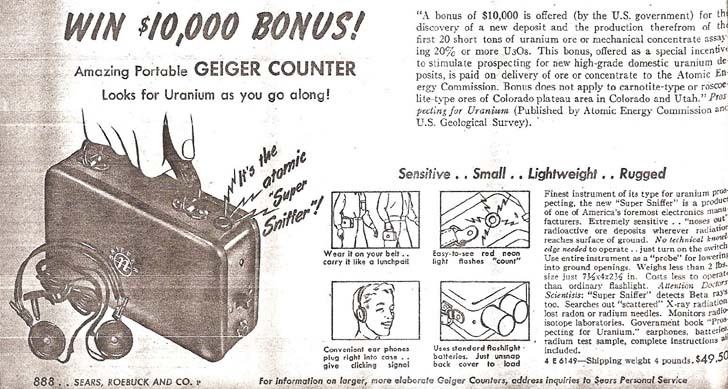 It was a small, portable Geiger counter for uranium prospecting and sold for $49.50. 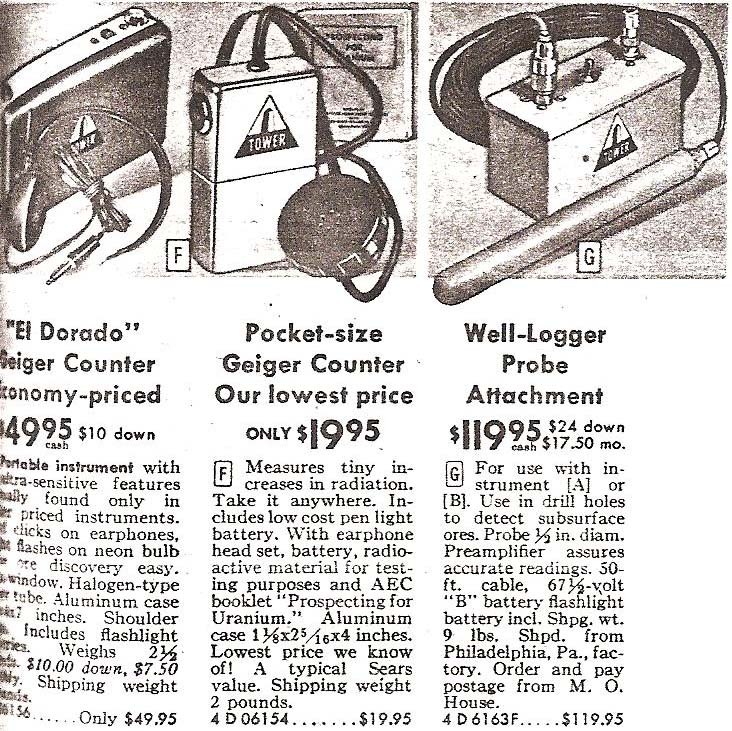 In 1951, they added the Precision Radiation Instruments (PRI) Lucky Strike Geiger counter selling it for $99.50 and the CIVION meter for $49.50. 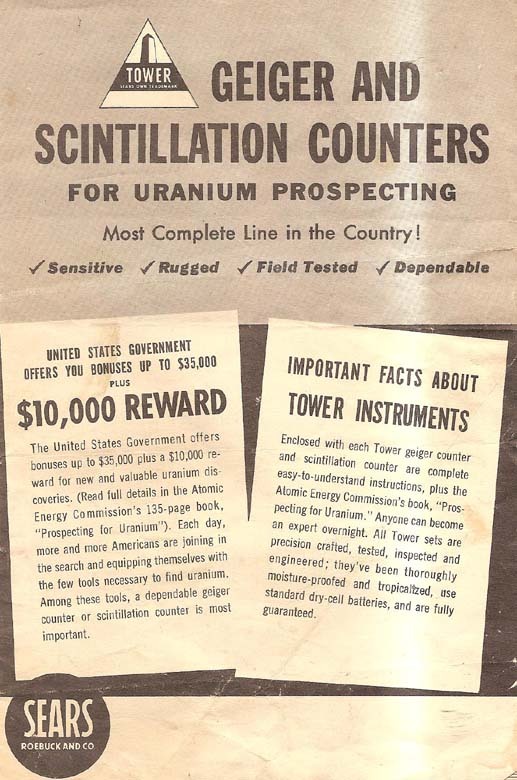 In 1952-53, they offered more PRI instruments including the Model 111 Scintillator for $495. 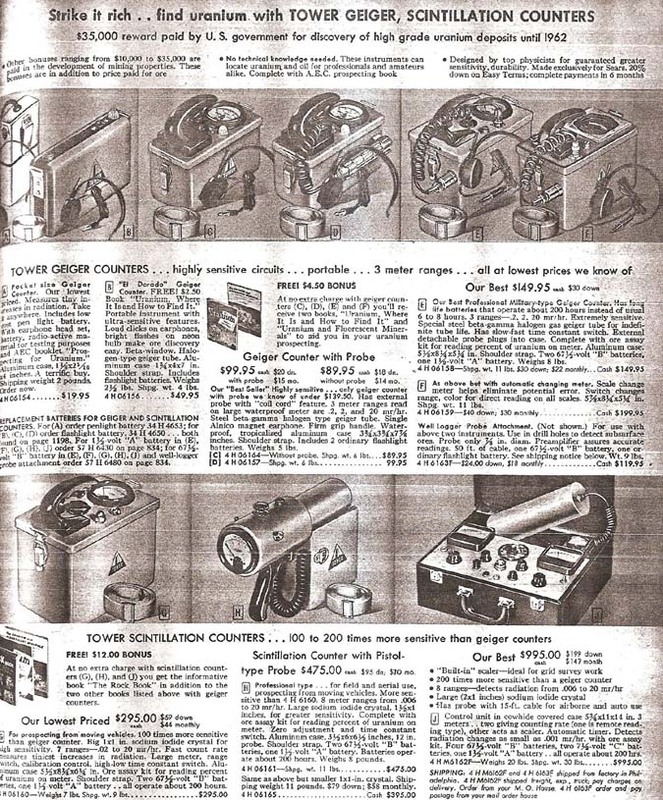 In 1954, they offered essentially the full line of PRI instruments including the Model 115 Super Scintillator for $595. 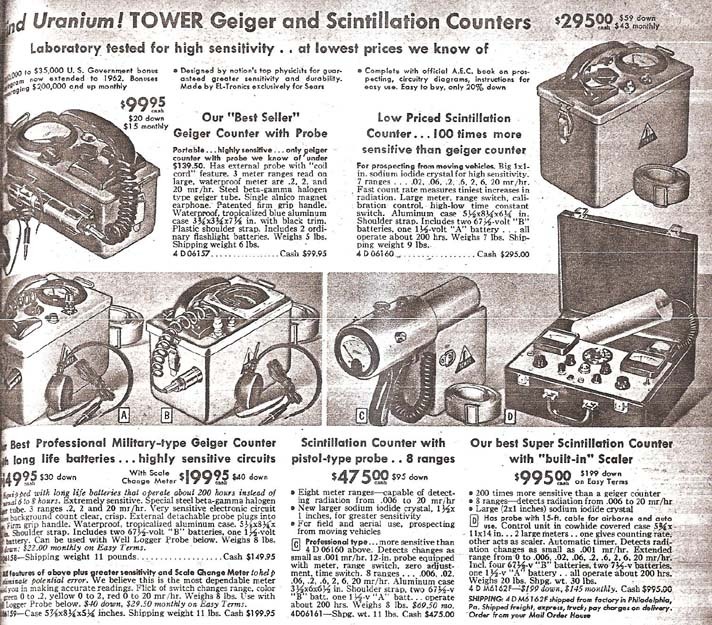 In 1955, Sears introduced the “Tower” complete line of Geiger counters and scintillation counters for uranium and oil field prospecting. The trademark was the Sears Tower. The Tower line was made exclusively by El-Tronics and included 8 products ranging in price from $19.95 for the pocket-sized meter to $995 for the Regal Super Scintillation Counter. The units could be purchased from mail-order, retail stores and order offices. They offered the “Sears Easy Payment Plan” and the “Most Complete Line in the Country”. In 1955, the RAD-TEK Radiation Detection Instrument was offered in cooperation with the Federal Civil Defense Administration. 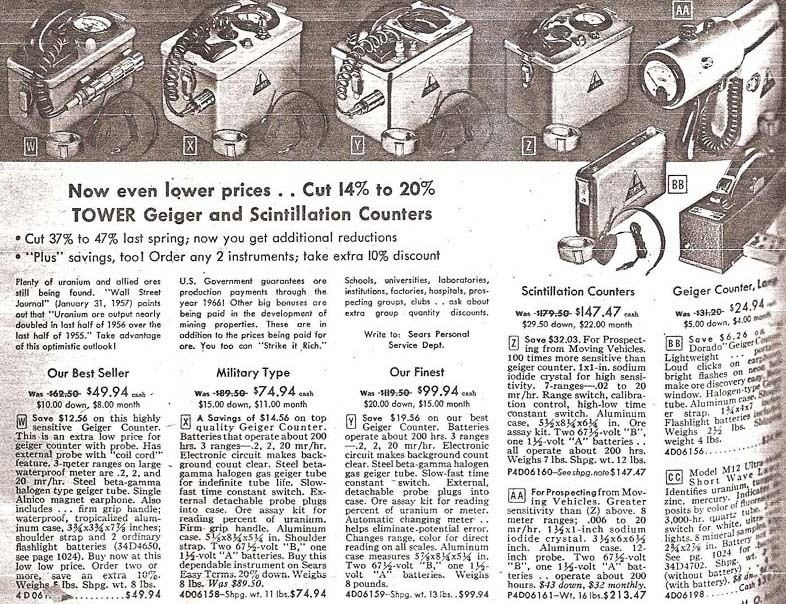 Sears continued to offer a selection of Geiger counters by PRI but soon went to exclusive products of El-Tronics. The Model 6154 is a pocket size Geiger counter. It has a bronze metal finish the size of a cigarette pack. It has a glass Geiger tube inside. It has a wire earpiece attached to a “U” shaped metal band. It operates on two AA batteries. It comes with a coin sized radiation source. The unit sold for $19.95 in 1955. The Model 6156 was a small Geiger counter for uranium prospecting. It was a sensitive instrument with a magnet earphone with give distinct clicks. It also had a neon bulb which flashes to indicate radioactivity. It had a green case with a black strap. The case was 1-3/4” x 4” x 7”. It came with batteries and testing sample. The unit sold for $49.95 in 1955. 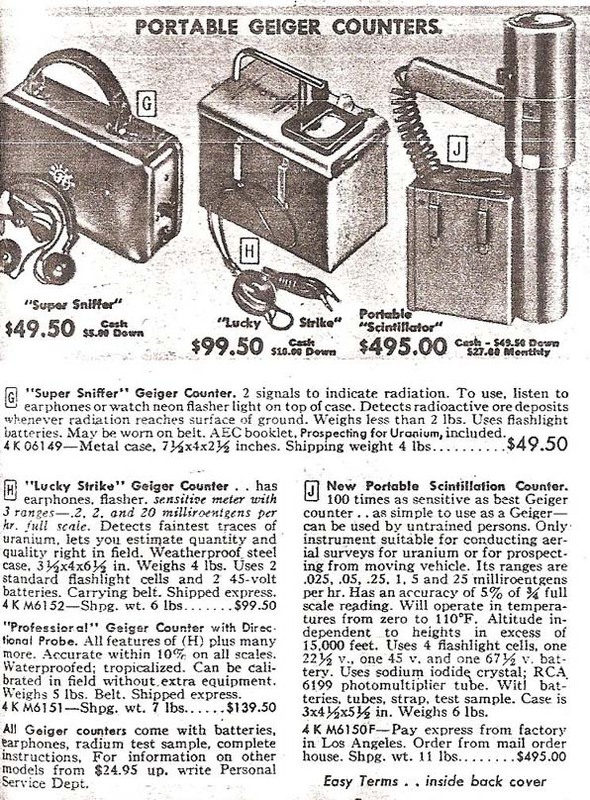 The Model 6157 was the Sears best seller and a highly sensitive Geiger counter. It had a highly sensitive, removable probe for measuring radioactivity in cracks and crevices. It has three ranges from 0.2, 2 and 20 mR/h. It had a earphone for detecting clicks from radioactivity. The unit had a blue case with black strap and measured 3-3/4” x 3-3/4” x 7-7/8”. The unit sold for $99.95. The Model 6158 was a high quality Geiger counter in a military-type unit. It used two 67.5 and one 1.5 volt batteries. It had a beta-gamma sensitive halogen-filled Geiger tube. The probe fits into the case when not in use. The unit is waterproof and tropicalized with a gray color. The unit was 5-1/8” x 5-1/4” x 8-1/4”. The unit had ranges of 0.2, 2 and 20 mR/h. The unit sold for $149.95 in the mid 1950's. 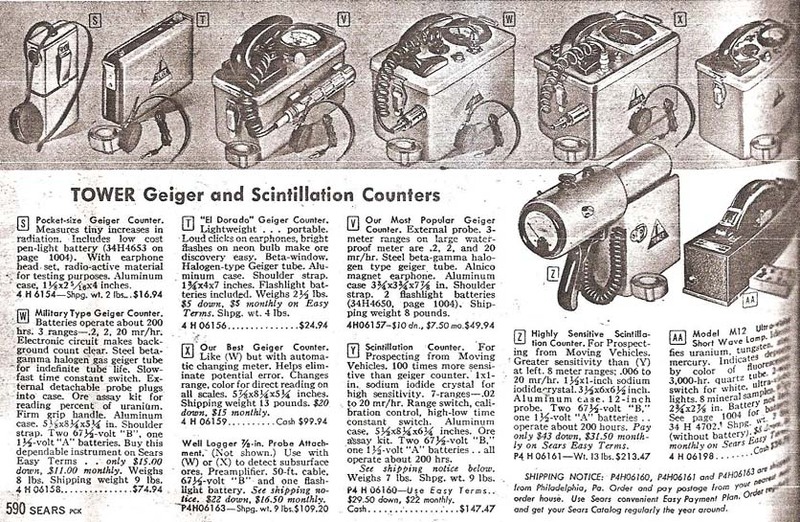 The Model 6159 (military designation PR-9) was Sears very best Geiger counter. It had a scale changing meter. The green scale reads 0-0.2 mR/h, the yellow scale reads 0-2 mR/h and the red scale reads 0-20 mR/h. It has the same military style features as the Model 6158. The unit sold for $199.95 in the mid 1950's. The Model 6158 and 6159 could be used with the Model 6163 highly sensitive well logger probe. The probe could be connected to the unit with a 50' cable. The probe sold for $119.95. 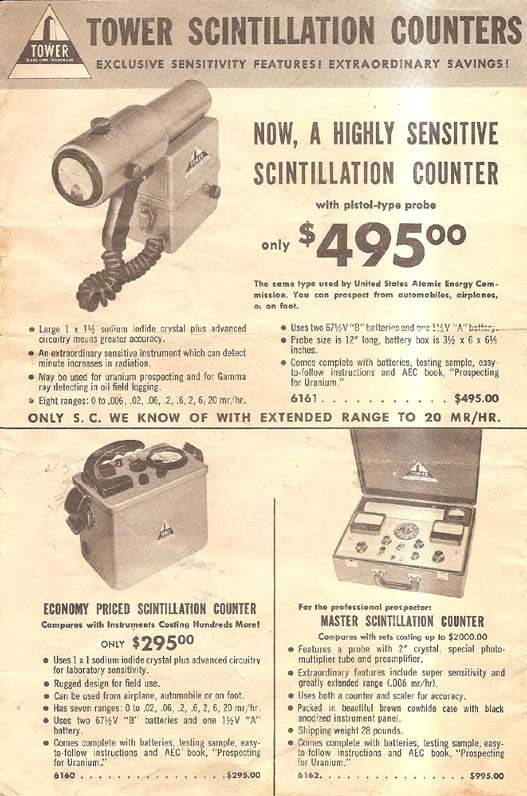 The Model 6160 was an economy priced scintillation counter. It had a 1” x 1” sodium iodide crystal. The unit was sensitive for use with an airplane, automobile or foot. It has seven ranges from 0.02, 0.06, 0.2, 0.6, 2, 6, and 20 mR/h. It used two 67.5 and one 1.5 volt batteries. It sold for $295.00 in 1955. The Model 6161 was a highly sensitive scintillation counter in a Cutie Pie configuration with a pistol type grip. It had a large 1” x 1.5” sodium iodide crystal. It was designed for uranium prospecting or oil field logging. It had eight ranges from 0.006 to 20 mR/h. It was the only scintillation counter with an extended range to 20 mR/h. It used two 67.5 and one 1.5 volt batteries. The probe is 12” long with a battery box 3.5” x 6” x 6.5”. It sold for $495.00 in 1955. The Model 6162 is a Master Scintillation Counter for the professional prospector. It has a 2” sodium iodide crystal with a photomultiplier tube. It has sensitivity ranges down to 0.006 mR/h. It has both a counter and scaler and is packed in a beautiful brown cowhide case with a black anodized instrument panel. The units weighs 28 lbs. It sold for $995.00 in 1955. 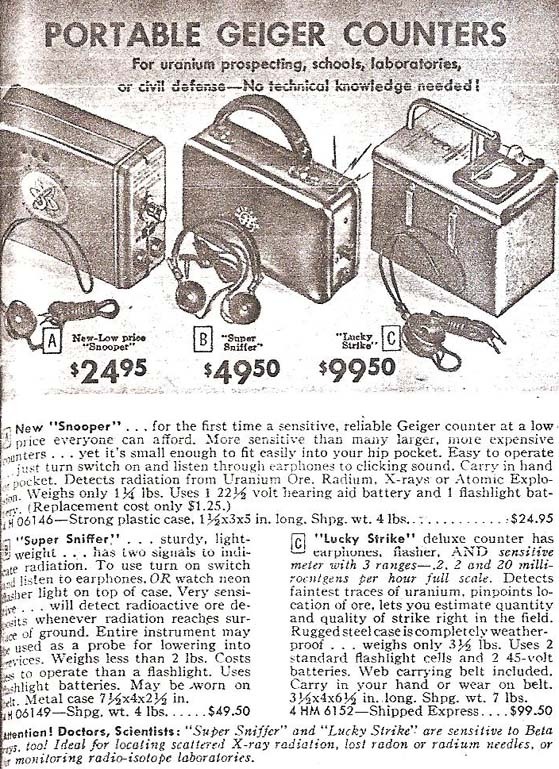 In 1957, as the Uranium Rush was winding down, Sears began to offer up to 20% off prices on Geiger counters. 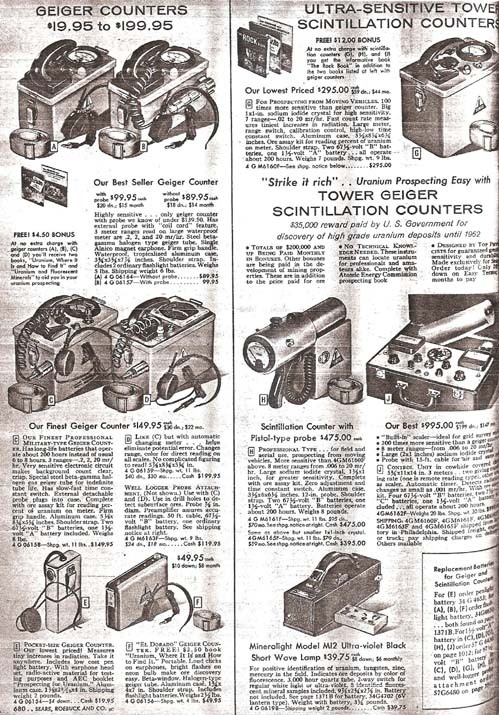 In 1958, Sears provided its final catalog offering of radiation detection instruments. In the final offering, the Model 6161 Scintillator could be obtained for $213.47, less than half of its price at the peak. 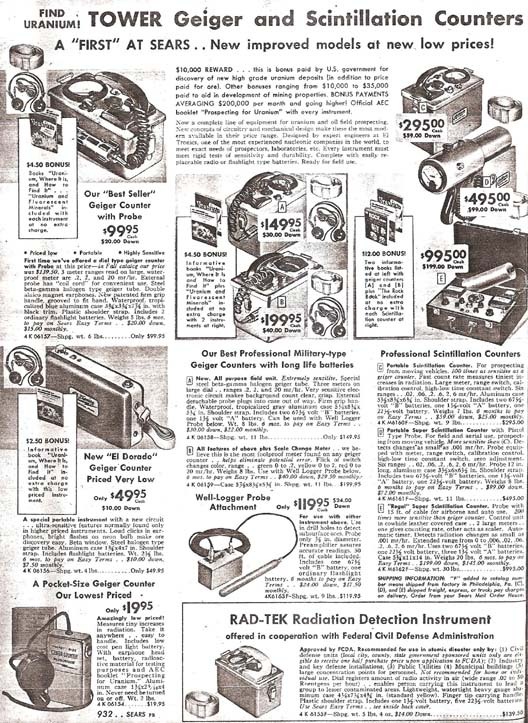 From 1950 to 1958, Sears advertised a wide range of radiation detection instruments in its popular catalogs. 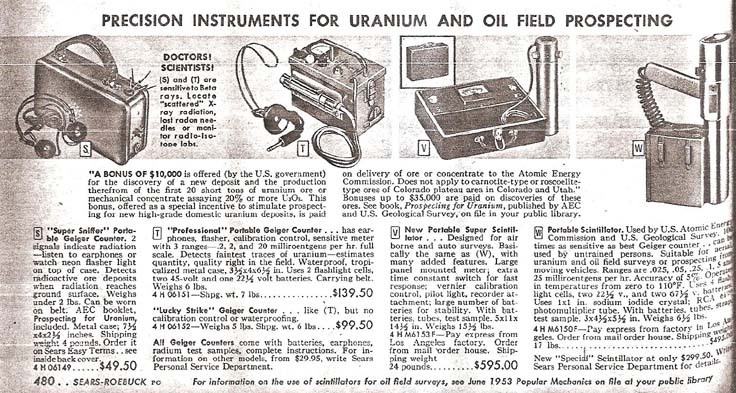 In the early 1950's, Sears listed 3-4 instruments but by 1955, they had over 12 models listed which was the peak of uranium exploration in the U.S. The instruments were developed by other manufacturers but sold in the catalog. The Sears Tower line of instruments was produced by El-Tronics. Sears offered low down payments, credit and a monthly payment plan.